In a medium saucepan, add the butter and cook over low heat until melted. Add the pumpkin, onion, carrot, apple, garlic, and thyme and cook for about 10 minutes, while stirring often. Increase the heat to medium and add the white wine. Cook until the wine is nearly evaporated. Add the chicken stock and reduce heat so that the soup simmers. Cook for 30 minutes, while stirring occasionally, or until all the vegetables are tender. Transfer the soup to a food processor, puree, and then strain through a fine sieve. Stir in the cream and season with the nutmeg, cinnamon, salt, and pepper. 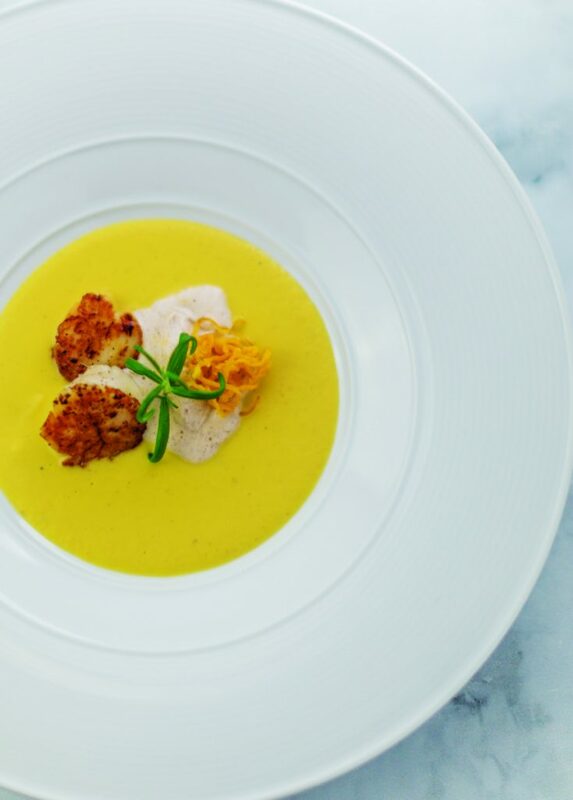 Place a Pan-Seared Scallop in the center of each bowl and cover with the soup. Garnish with the Crispy Pumpkin Strips, a dollop of the Chinese Five-Spice Cream, and the sprigs of rosemary. Place the olive oil in a medium nonstick pan and cook over high heat until warm. Season the scallops with salt and pepper and place them in the pan. Cook for approximately 2 minutes, turn, and cook for 2 more minutes. The scallops should be golden brown on each side. Remove the scallops from the pan and place on a paper towel-lined plate to drain. Place the oil in a Dutch oven and cook over medium-high heat until it is 375°F. Use a peeler to cut the pumpkin into long ribbons. In a small saucepan, bring the water to boil. Add the pumpkin ribbons and cook for 1 minute. Remove and submerge in ice water. Dry the pumpkin thoroughly and then place into the hot oil. Fry until golden brown, remove, and set on a paper towel to drain. Season with salt and serve. Place the cream in a bowl and whisk until medium peaks begin to form. Add the Chinese five-spice and the salt. Mix until combined and refrigerate until ready to use.